Yes, it is that time of the year again when there are not enough hours in the day and a long shopping list for our loved ones to attend do. With Xmas decorations up in Harrods from August ( I don’t know about you but I call it spoiling a good holiday ) and Christmas jingles on the sound systems in the department stores from October ( do we start getting ready for Christmas as soon as the one before is over ? ) one feels more harassed than excited by the time it really is the time to buy Xmas gifts. Well, some brands just make is easy for you and the idea with which Aurelia probiotic skincare team is moving towards Christmas will make your frown disappear. Aurelia Probiotic Skincare only launched in the beginning of the year but it has been gaining firm ground not just with their products but with their creative ideas as well. This Christmas you can choose from a Miracle Morning Time Gift Set or a Relax & Repair Night Gift Set ( or both if they make your pupils dilate in excitement ). Aurelia Miracle Morning Time Gift Set ( £55 ) contains Miracle Cleanser ( 120mls ), one of my Aurelia favourite products, as well as the beautiful pink cup & saucer with gold edging and a morning chamomile citrus tea blend. The cleanser itself is a perfect gift, as it caresses & purifies your skin at the same time. It has such a beautifully crafted formula that your fingers will glide over your face, not drag it. Your skin will feel reinvigorated, cleansed and perfectly ready for the application of serum, moisturiser or face oil. With you looking and feeling beautiful, sip a refreshing cup of tea infused with freshly dried Egyptian chamomile flowers, herbs and slices of citrus fruit. The tea has a mellow, sweet flavour and its citrussy, sharpening undercurrents will allow you to start even a gloomy day on a perfect high. Aurelia Relax & Repair Night Time Gift Set ( £65 ) contains Cell Repair Night Oil ( 50mls ) and Aurelia’s signature warming tea blend, that will help your mind and body to unwind after a hectic day, as well as the pretty gold and pink cup and saucer to savour it from. Aurelia night oil is a beautifully luxurious product that cocoons your skin and helps to brighten and repair, as well as moisturise your skin, which is being challenged but plummeting temperatures outside and radiators inside. Add to that late nights, partying and drinking more alcohol and your skin is more likely to be cross than happy. Before going to bed, no matter how late (! ), cleanse your face, apply this intensive boosting treatment and go to bed knowing that you will wake up with a beautiful, rather than tired, complexion. 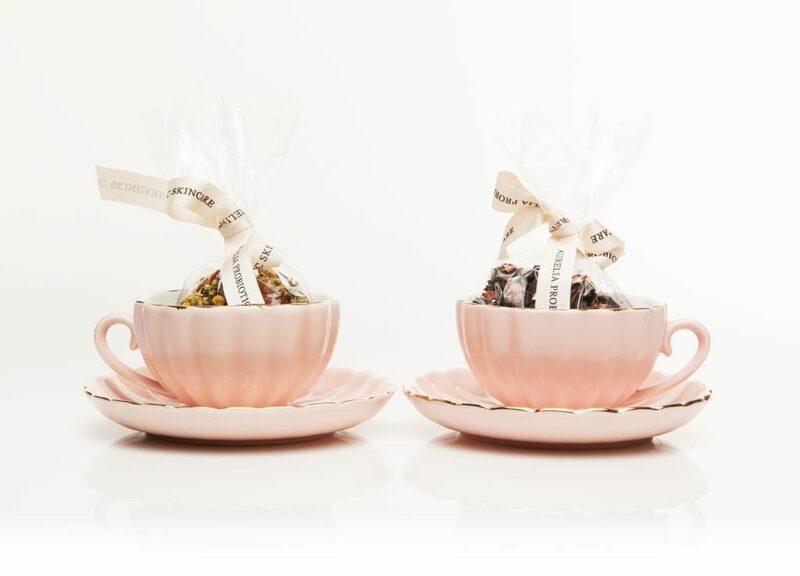 Aurelia’s signature Mandarin Rose Petal tea blend has rich China tea leaves that gives tea its authenticity, mixed with the relaxing pink petals, and mellow flavour with rose and chocolate undertones. I like drinking it when I write late at night, as it helps to unwind the mind without rendering it useless. You can also get a great stocking filler in the shape of Aurelia’s Monday to Sunday Bamboo Muslin Gift Set ( £18 for seven antibacterial cloths that will gently buff away dead skin cells revealing a smoother and more radiant complexion ). I truly believe that presents shouldn’t be gifted just for the sake of it, they should be chosen with care and hopefully knowledge of what your family member, friend or colleague likes. Aurelia’s christmas gift sets – special, indulgent and long-lasting – will show the recipient that you truly care about her. And who knows, your mother, sister, girlfriend or mentor might be smiling and thinking of you when they apply Aurelia cleanser or night oil or enjoying a fragrant and freshly brewed cup of tea. After all, we all deserve our moment of peace and true indulgence and the happy vibes that come with it. From now on till the end of December all Aurelia skincare purchases will be wrapped free of charge in a luxurious gift box lined with black tissue paper and tied with silk Aurelia Christmas ribbon.